Water Features - Bellaire Landscape Inc.
Landscaped water features have been growing in popularity for many years. Ponds, waterfalls and fountains add beauty and tranquility to any space. The naturally soothing sounds given off from landscaped water features induce relaxation and peace to the surrounding area. Bellaire Landscape offers many sizes and varieties of water features to choose from. A water feature can be an elaborate waterfall constructed of many tons of rockery stone or simply a small bubbling rock. We can design a waterfall that wraps around a bench at the edge of your pool so that you and a loved one can sit under the flowing water and enjoy the scenery on a hot day. If it were up to your kids we are sure there would be a cave near the pool with a flowing waterfall that they can hide and play in with their friends. Regardless of the design, water features add both visual and auditory beauty to your landscape. In addition to their obvious charm and beauty, garden fountains and waterfalls are thought to provide holistic health benefits to those around them through the presence of negative and positive ions in the running water. The negative ions being released by the water from the garden fountains or waterfalls naturally increases and purifies energy. As this happens, it is supposed to help relieve depression and stress in the body. If you decided to choose a landscaped pond, you will have the extra benefit of adding fish and an assortment of water plants to enhance the natural colourful beauty of your landscaped yard. Give your pool or spa a Rico Rock makeover! Enjoy the soothing sound and shimmering sight of falling water with a water feature like a pool or spa. Flowing water is soothing to look at and listen to. 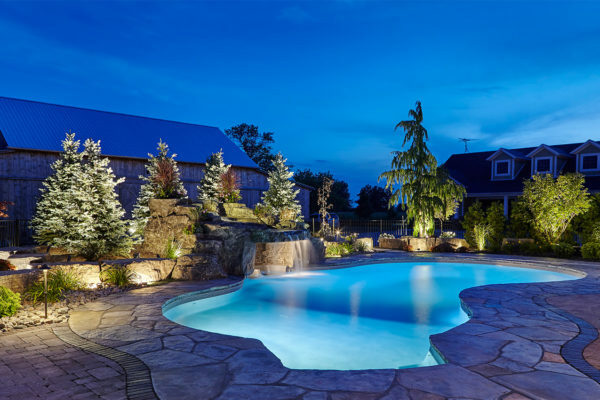 From a shimmering sheet of rock to an elaborate tumbling rock cascade, a Rico Rock or modular waterfall will bring your pool or spa to life. Now you can add this fluid beauty to any new pool or spa or when it’s time to build or update your backyard paradise. 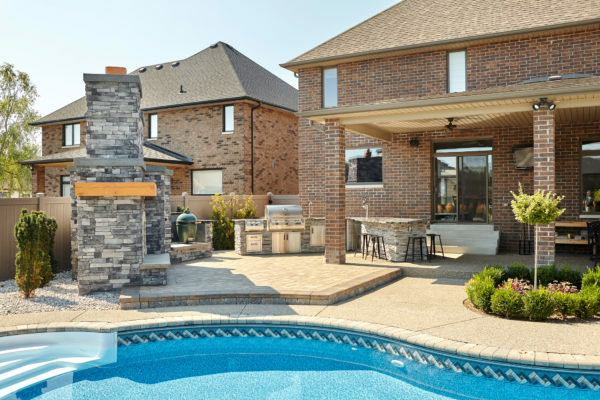 Adding a water feature to your landscape will make you the envy of the neighbourhood!